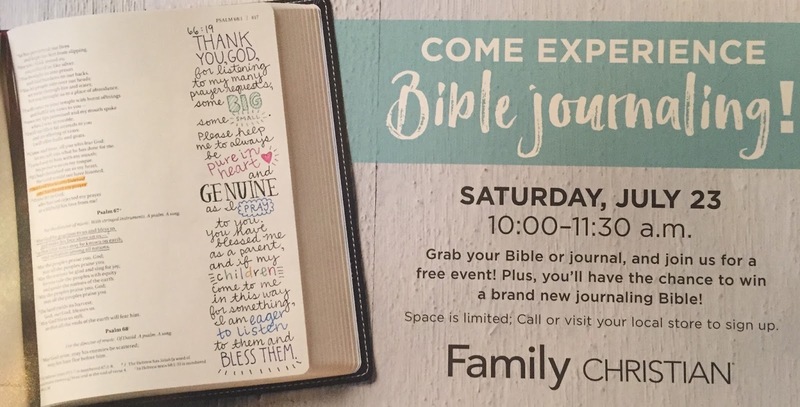 Family Christian Stores hosted Bible Journaling events at their stores at the same time, same day nationwide - yesterday, July 23rd. I led the one at the Troy, Michigan store, which had the maximum number of participants. Store manager Tracey had everything organized so well for the hour and a half session. Only one regret - I didn't take photos!! Participants came from various Metro Detroit locations, not just Troy. Their enthusiasm for a new way to study the Word was evident. Some had been immersed in Bible Journaling for awhile, others were eager to learn about products and techniques for expanding their study. DaySpring's Illustrated Faith materials were used and included diecut embellishments with Scripture prompts on the back. 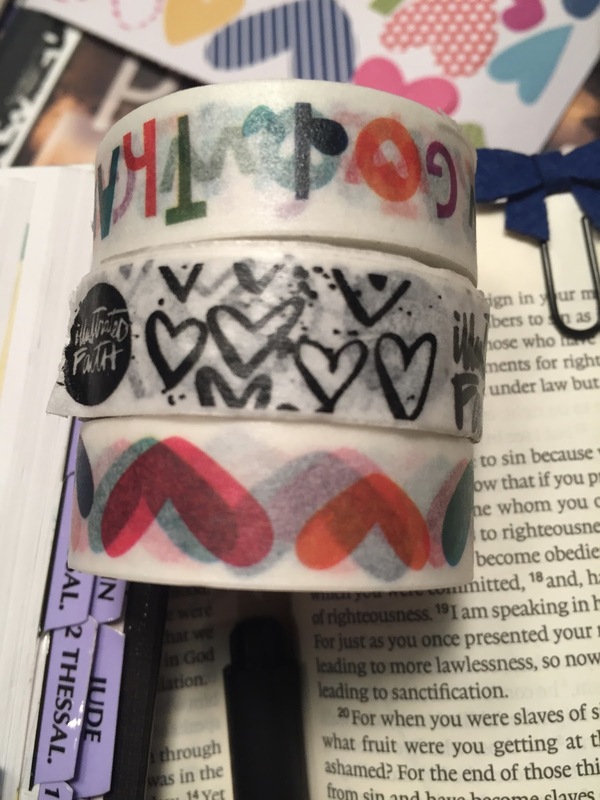 Everyone was introduced to their washi tape, stickers, pens, etc. A workbook with practice pages was also provided....so many interesting things to share and use. Illustrated Faith's Founder is Shanna Noel, and the resources available from their product line are helpful and unique, especially when we get stuck and just don't know how to express something in our journaling, or we just don't know where to start. We talked about studying the context of a word or verse, then journaling about what spoke to them in that reading. The journaling could be done in their Bible or a separate notebook by writing out a verse or word and making notes about applying it to his/her life. It could be embellished artistically through pictures and/or words via pens, paints, stencils, stickers, etc. Emphasis is not on perfection, but on spending time in the Word in a way that lets us linger longer. At the end each participant eagerly searched out journaling resources in the store, and talked of how to carry this on in their own church. Several us will be meeting again in September. Congratulations to Chelsea, a new bride. She was the recipient of a new journaling Bible given to one participant at the event. 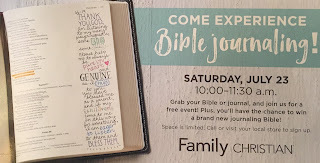 Join me this Saturday at the Bible Journaling Event hosted by Troy Family Christian store. Call right now to reserve your space!